Carolina Skiff, Boston Whaler and Sea Hunt boats are very well known for their T-Top feature! A t-top is a great addition to your center console boat. They are tall enough to stand under to provide protection against rain and UV rays, and they make a great platform for your fishing equipment. 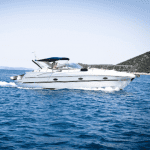 But when you are not on the water, how do you protect your valuable boat, t-top and equipment? When it comes to protection it is important to consider what will work best for you. There are multiple types of covers available for this style of boat. Most likely, it will come down to your personal preference, and how you need the cover to meet your needs. If you are interested in covering your entire boat, Carver offers an excellent choice with many benefits. 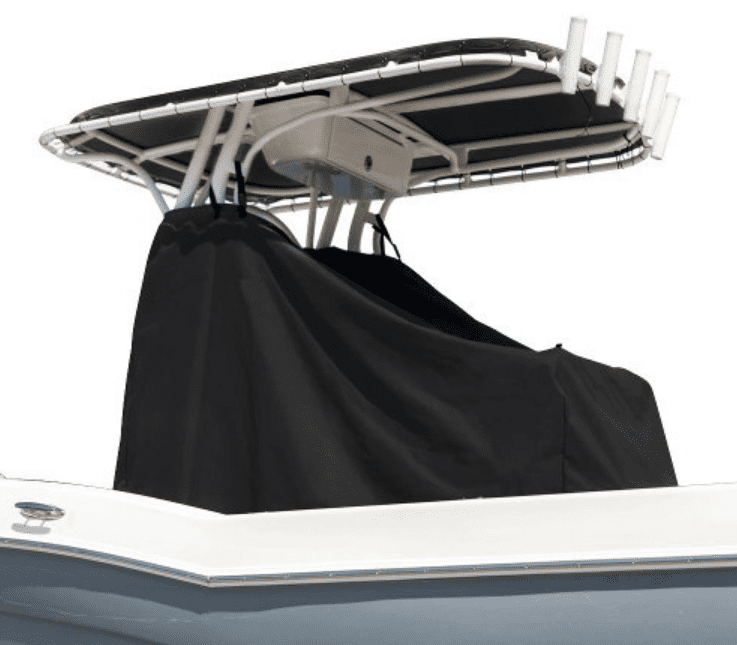 This cover goes up and over your t-top and will provide coverage from the bow to the transom (including the motors). This full cover can provide the ultimate protection. Of course, you may question how it will accommodate your radar dome and other equipment. Luckily, it has a hook and loop (similar to Velcro) slot at the rear of the t-top, which is made to allow your antennas to exit. Your cover will even come with support poles equipped with end caps. The support poles will sit in your rod holders to alleviate any pressure on the equipment. A zipper on each side allows easy access to the boat without having to remove the cover. This is a great storage cover that would provide the protection that you need. But what if you need something that is less time consuming and more suitable for day to day use? Don’t worry; we have options for that, too! Carver also kept in mind that you may want something for only the t-top. This cover will go over the t-top, as well. Meaning it will provide protection for all of your console’s equipment without the efforts of a full cover. Just like the previously mentioned cover, it will have the hook and loop closure that allows your antennas to exit. This t-top only cover is based solely on your dimensions. If there is extra slack in the cover, an adjustable buckle and strap is sewn in to create a more customized fit. The support poles that are included ensure that the cover does not apply pressure to your fishing equipment. A zippered access point will allow you to access the center console without having to remove the cover; which is a great addition to this style of cover. 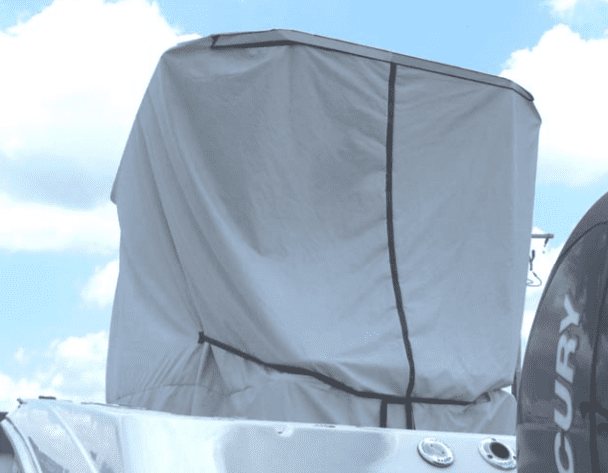 If you need protection for only the t-top while your boat is stored, this is a great option. But you may ask, “what if I want to travel and protect my t-top”? The newest addition that we offer is a universal t-top center console cover made by Westland. Protection is provided in the top of the line material, Sunbrella. This will ensure that the steering wheel and gauges aren’t exposed to harmful elements. The cover will protect your center console by attaching beneath the t-top. Along with the center console, protection is also provided for the helm seat. Similar to the previous cover, you simply choose your size based on the dimensions. It will also have adjustable straps that allow you to tighten for the best fit. One of the best benefits to this cover is the fact that you can trailer with it. When attached properly this t-top cover ensures your center console is protected from debris and wet weather that happens on the roadway. Depending on your needs and circumstances, we are happy to offer you multiple options. Sometimes, you may want a variety of covers depending on your current situation. The full cover may be a great idea for winter storage when exposed to the outdoors. 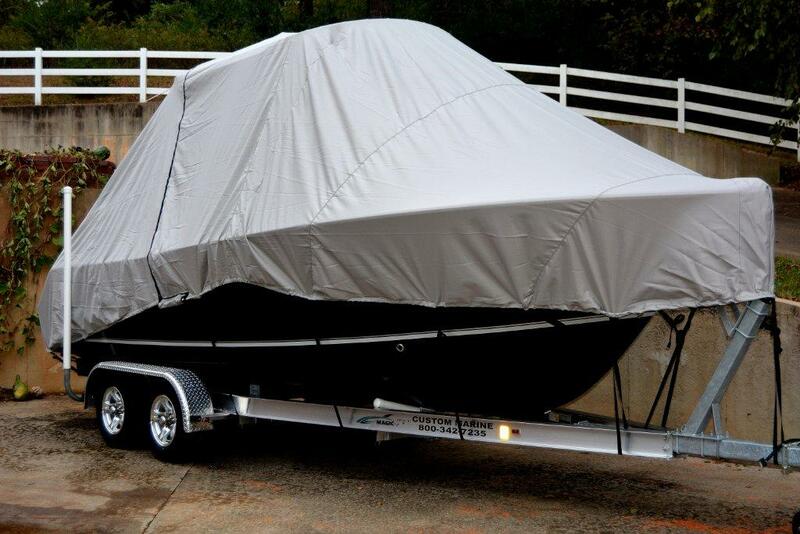 The t-top only cover by Carver is a great storage solution should you have a covered roof area that you store your boat under, and need a cover that is quickly and easily removed. The t-top center console cover by Westland is an excellent choice for ease of installing and removing the cover quickly. The simplicity of attaching underneath the t-top is a great bonus. Protecting your valuable boats and the equipment for them is important to us. We want to make sure you have just what you need! Next: Sea-Doo vs. Yamaha vs. Kawasaki — Which PWC Is Best?